Sometimes it is nice just sit and play with paper. I have brand new stamp from Penny Black – winter fairy. Amazing stamp. I coloured it with watercolour pencil, than I add some 3D snow and Silhouette glitters. For background I used amazing papers from Galeria papieru, Polish factory. And with Memor box I made snowflakes. My second card is also coloured with watercolours, it is my lovely Gorjuss. I must admit – I need better watercolours with more pigment. I have just cheap one from Papermania (Docrafts) and one from Koh-i-noor and they are not so strong. For light colours they are just OK but for rich colours like at Gorjuss doll I had to use one of my another colours Creta color (but I have only 6 colours). Paper which I used for this card is 7 dots studio – Destination unknown. 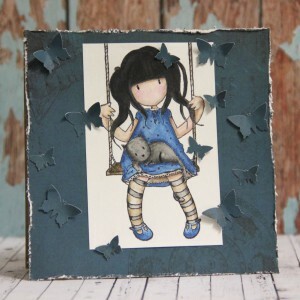 This entry was posted in Cardmaking and tagged cardmaking, Gorjuss, Penny Black, watercolours.